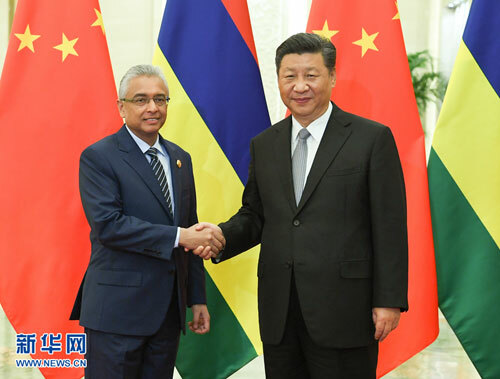 BEIJING, Sept. 2,Chinese President Xi Jinping met with Mauritian Prime Minister Pravind Jugnauth on Sunday ahead of the 2018 Beijing Summit of the Forum on China-Africa Cooperation. 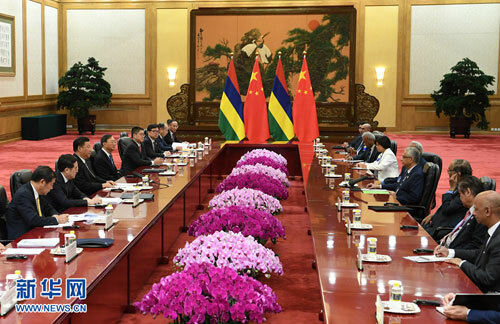 Xi said that during his successful visit to Mauritius about a month ago, he deeply felt that China-Mauritius friendship enjoys popular support and broad prospects. The two sides should give full play to the political guiding role of high-level exchanges, increase communication, continue to understand and support each other on issues of core interests and major concerns, further enhance political mutual trust, and actively conduct win-win cooperation, Xi said. China will continue supporting Mauritius in playing an active role in international and regional affairs, and support small island nations in implementing the UN 2030 Agenda for Sustainable Development, he said. Jugnauth said President Xi's visit to Mauritius has provided a new and strong driving force to the development of Mauritius-China relations. Noting that his country is undergoing an economic transition, Jugnauth said Mauritius hopes to learn from China's development experience and enhance cooperation with China. Mauritius firmly supports multilateralism and would like to strengthen cooperation with China on international and regional issues, he said. Jugnauth expressed thanks to China for taking into full consideration the reasonable concerns of small island nations like Mauritius in preparing the summit. Mauritius supports President Xi's initiative of building a community with a shared future for humanity, and is ready to jointly build an even stronger China-Africa community with a shared future, he said.